Have a young daughter who isn't quite ready to get her ears pierced? Poppy Drops is the perfect way to give her temporary earrings that she will love! and Sweetie-Pie like the one above we reviewed. No piercing, no pain, but days of fun! They are waterproof so will not just wipe off during the bath. You will need to remove them with baby oil or rubbing alcohol. 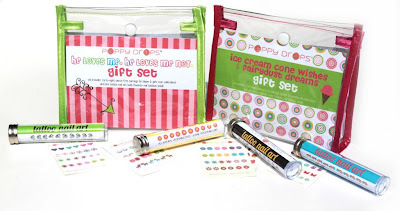 These would make fantastic stocking stuffers or gifts for a young girl! These come with a beautiful selection of temporary earrings and nail art as well! A must have for the little girls in your life! The earrings we tried are long lasting, look adorable, painless, natural, and super fun for little girls to dress up a little bit! Poppy Drops is a great solution to helping your daughter feel beautiful, without having her grow up too fast. This would be great for my five year old. She always wants to wear earrings but I am not ready to pierce her ears.